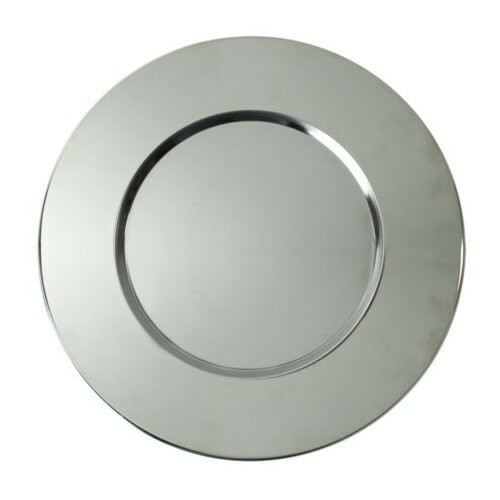 Home > Products > ChargeIt by Jay Bridal Stainless Steel Round Charger Plate 12-3/4"
Set an elegant table at your formal affair with the ChargeIt by Jay Bridal Stainless Steel Round Charger Plate 13". Simply place this charger plate under standard size plates and platters for a brilliant, eye-catching backdrop for your dinnerware. Perfect for wedding receptions, anniversaries, and more, this timeless-looking charger looks great when paired with china patterns and simple white ceramics. For outstanding durability and longevity, this round charger is made from high quality, rust resistant stainless steel. To properly care for this charger plate, hand washing is recommended.